India and China are showing strong leadership to combat climate change and the decision by the US to withdraw from the Paris Agreement will not deter these global efforts, the UN Environment chief said on Thursday. “The science on climate change is perfectly clear: we need more action, not less. This a global challenge. 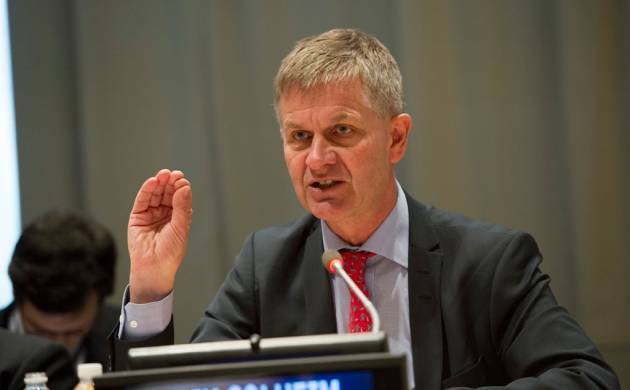 Every nation has a responsibility to act and to act now,” UN Environment Programme (UNEP) Executive Director Erik Solheim said in a statement responding to President Donald Trump’s announcement that the US will withdraw from the ambitious climate pact. “The US decision to leave Paris in no way brings an end to this unstoppable effort. China, India, the European Union and others are already showing strong leadership. 190 nations are showing strong determination to work with them to protect this and future generations,” Solheim said in a statement. Solheim said there is incredible momentum on climate action from individual states, cities, the private sector and citizens and a single political decision will not derail this unparalleled effort. “Committing to climate action means helping countries like Iraq and Somalia on the front line of extremism and terrorism. It means helping coastal communities from Louisiana to the Solomon Islands,” Solheim said, adding that it also means protecting food security and building stability to avoid adding yet more refugees to what is already an unprecedented global humanitarian crisis. He underscored that the Paris Agreement is founded on clear evidence, solid science and incredible international collaboration. “It will put aside differences to tackle a common, monumental challenge. The reversal of damage to the ozone layer proves that such a global effort can succeed. Ultimately, this is an investment in our own survival that no-one can afford to abandon,” he added. Trump’s decision to withdraw from the climate agreement drew strong reactions from various quarters. By pulling out of the climate deal, the United States joins Syria and Nicaragua as the only nations not participating in the global agreement. Members of The Elders, a group of independent leaders founded by South African President Nelson Mandela, condemned Trump’s decision, saying US withdrawal does not mean the demise of the Paris Agreement and urged other signatories to continue to respect its provisions. “Climate change is the great existential threat of our time. The Paris Agreement was born out of effective multilateralism and a desire to find a cooperative solution to a global problem. No one country can dismantle the Agreement. While the US withdrawal weakens that international accord, it will not trigger its demise,” Chair of The Elders and former UN Secretary General Kofi Annan said. Mary Robinson, member of the group and former UN Special Envoy on Climate Change said the US “reneging on its commitment to the Paris Agreement renders it a rogue state on the international stage. “But the Trump administration’s withdrawal from the Paris Agreement will not stop climate action in the United States. We encourage all actors in the US working to tackle climate change to stand their ground, share the benefits of their work and to keep making their voices heard,” she said. Democratic Senator Ed Markey of Massachusetts, a member of the Foreign Relations Committee and Environment and Public Works Committee, said with his decision, “Trump is breaking a promise to the world to combat climate change in order to keep an empty campaign promise to the coal industry. “Withdrawal from the climate agreement is a betrayal of scientific fact, economic opportunity, and moral leadership. Turning our back on this agreement will be a disaster for America—for our businesses, for our health, and for our national security,” he said. The League of Women Voters president Chris Carson said withdrawing from the Paris Climate Agreement is a “giant step in the wrong direction” for the health of the planet and all living beings. “Trump’s decision today will undermine global cooperation and have a harmful impact on US relations with our most trusted world allies. The long-term effects of this decision will make more people sick, especially children and the elderly,” Carson said.